It was definately an artsy weekend for me as I headed down to The Atmosphere at Seri Kembangan to witness the launch of Artsphere 20/8th showcasing 80 mural arts by 20 artists. Now these mural arts aren't your run of the mill art, as the majority of them are depicted in 3D, showcasing some very talented works by our local art community. `The Atmosphere’ has decided to spare their walls and give them an artistic environment as they invite 20 artists to bring life to `The Atmosphere’ with 80 mural artworks. The thematic concept `Artsphere 20/8ty’ pays tribute to the 20 talented artists, whose 80 pieces of mural artwork adorn the vicinity, making `The Atmosphere’ the single location with the highest collection of mural art in Malaysia. Arriving at The Atmosphere on a lazy Sunday morning, it was a good thing the mural arts were very interesting and captured our eyes as we could even interact with some of the 3D murals. It was a carnival like atmosphere, as street performers, cosplay costumed folks, music and laughter filled the area. It was a pretty new spot, hence the Artsphere 20/8ty launch really livened up the whole area. In addition to selfies with the art works on the walls and floors, a Polaroid Photographer will be available at the event ensuring that you leave with a memento in Polaroid form too. It didn't take long before the Artsphere 20/8ty was officially launched, amidst a violinist and lots of dancers on stage. Going through most of the 3D mural arts at Artsphere 20/8ty, I must say it was pretty cool, having high levels of interactivity if you're game for it. Just position yourself and blend into the 3D art, snapping a photo to keep for memories. The best part is, all the murals are here to stay, so you need not worry it will disappear one fine day. Check out more mural arts below, this time without any human poses as I was snapping alone. While walking around, I was really pleased to see a lot of my friends were having the time of their life posing and snapping photos with virtually every mural art at Artsphere 20/80ty. Smiles and laughter were heard at every corner of Atmosphere Seri Kembangan, definately worth waking up early for this launch event. A couple more photos of some of the 80 mural art below. Hop on the bike, and let's go for a spin! 1-3, Jalan Prima Tropika Barat 2, Taman Prima Tropika, 43300 Seri Kembangan, Selangor Darul Ehsan. Oh, and if you decide to check out Artsphere 20/8ty Mural Art @ The Atmosphere Seri Kembangan anytime soon, do note that they have an on-going FB "Strike A Pose" photo contest with a chance to win RM15,000 worth of prizes. Check out the mechanics below. “Strike a Pose” with your desired mural art and stand a chance to win outstanding prizes on Artsphere 20/8ty-Official Facebook Photo Contest! This contest begins on the 22nd December 2013 with the first round of the competition themed “Most Liked Photo”. Participants who’ll upload their most creative photos on our Facebook page and receive the most “Likes” will be dubbed the winner! For those who did not win, don’t fret! You are entitled to be part of the second round of this competition that is themed “Most Creative Photo”. Judged by the hip and artsy folks from the management team at The Atmosphere, they’ll get to decide on the winning shot. So get snappin’! 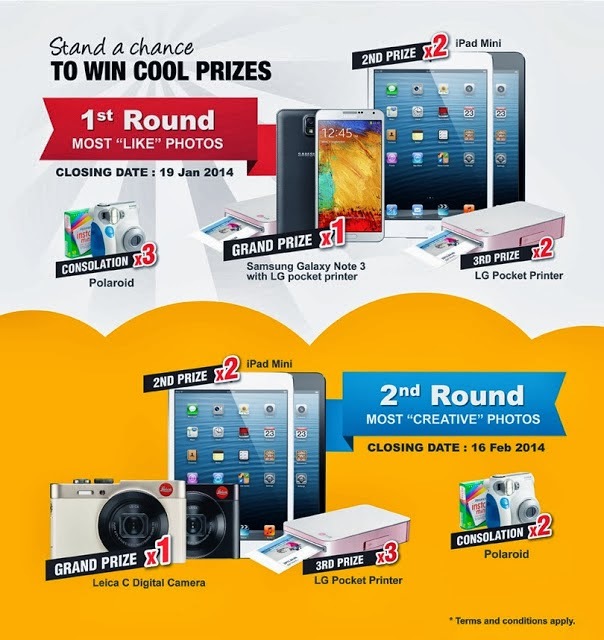 Fabulous prizes with a total worth of RM15,000 are up for grabs. Bring out the creativity in you and log in to https://www.facebook.com/artsphere208tyofficial for further information. Nice! Gotta visit this place when I hop over to KL again. Melissa would love it a lot! nice, i just went there last sunday.